This is a recipe from Clarisa Ponce de Leon & I added my own touch to it, but I still wanted to share it with all of you! 1. In 1 small bowl, mix the active dry yeast with 1/4 C of warm water & 2 tsp of coconut sugar. Let it sit for 10 minutes. It will become bubbly and triple in size. 2. In a 2nd small bowl prepare the your vegan egg. Let it sit for 10 minutes. 3. In 3rd small bowl, place the nuts & fruits & sprinkle 1 tablespoon of flour. Toss it with a spoon until all fruit & nuts are well coated. Set aside. 4. Using a stand mixer with the hook attachment, mix 3 C of the flour, sugar, turmeric, & softened earth balance butter. 5. Add the vegan eggs, orange & almond extracts, & lemon zest. Mix some more. Then add the yeast & maple syrup (or whatever you choose) & keep mixing until well integrated. 6. Warm the milk until it feels safe to touch, not too hot or it will kill the yeast. Add it slowly to the mix, while the mixer is running. 8. Preheat oven to 350°F. On a floured surface, knead the dough for a few minutes. Do not add too much flour, it should remain fairly sticky. The transfer the dough to the prepared bowl & cover it with a tea towel. Let it rest in a warm place for 1-2 hours, or until double in size. 9. Once it has doubled in size, take it out of the bowl, and place it on a floured surface. Add the nuts & fruit & knead until well integrated. 10. Take the dough & place it in the panettone paper mold. Cover it with a tea towel & let it rest for 1/2 hour on top of the warm oven so it re-rises. 11. Before putting the panettone in the oven, brush the top with maple syrup or honey. Bake for 40-45 minutes. 12. Let it cool completely before serving. 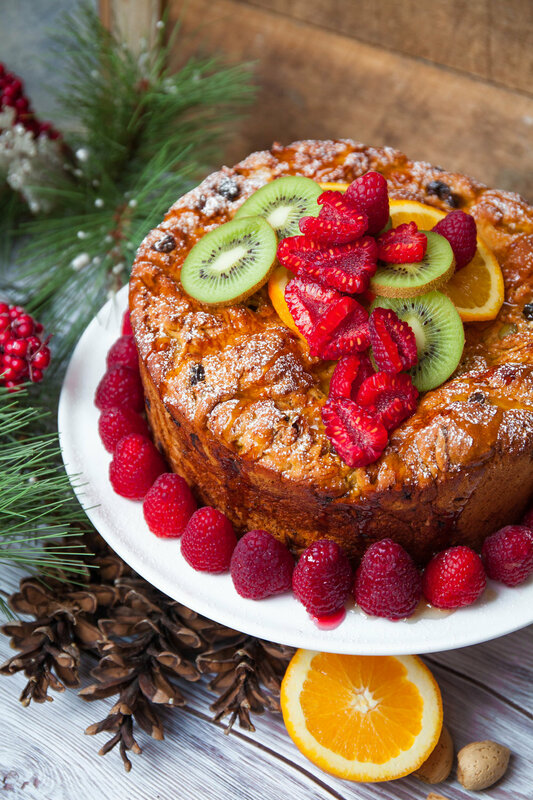 Garnish with lots of fresh fruit, nuts & powdered sugar.